How much will my snow-cone machine produce? Your snow-cone machine was engineered to shave 500 lbs. of cube or chunk ice per hour. Machine will yield 1000 sno-cones per hour. How much ice will I need? Most snow-cones are 4-6 oz. A 20# bag of ice should produce 40-50 snow cones. Can I use block ice to make snow-cones? You can use block ice to produce sno-cones but you must first break it down into 3-4 inch pieces. Ice will not fit the horn if the pieces are too large. How much syrup should I use to flavor my snow-cones? One 6 oz sno-cone will take 1-2 ounces of syrup cones will not hold more than that. **Each quart of syrup is good for about 16 snow cones or more. 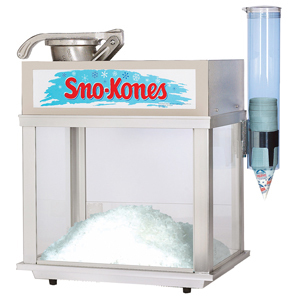 * Please call us for any questions on our sno cone machine w/scoop rentals in Ventura CA, and surrounding metro area.